Uninhabited Koh Chang islands, scattered off the island in directions north, east, south and west, can be reached by kayak or as part of a boat trip. Perhaps the most well known of these is Koh Klum, which lies just past the bay in Bang Bao, but the eagle-eyed will also spot Koh Yuak and Koh Chang Noi on the maps and flyers for snorkeling. 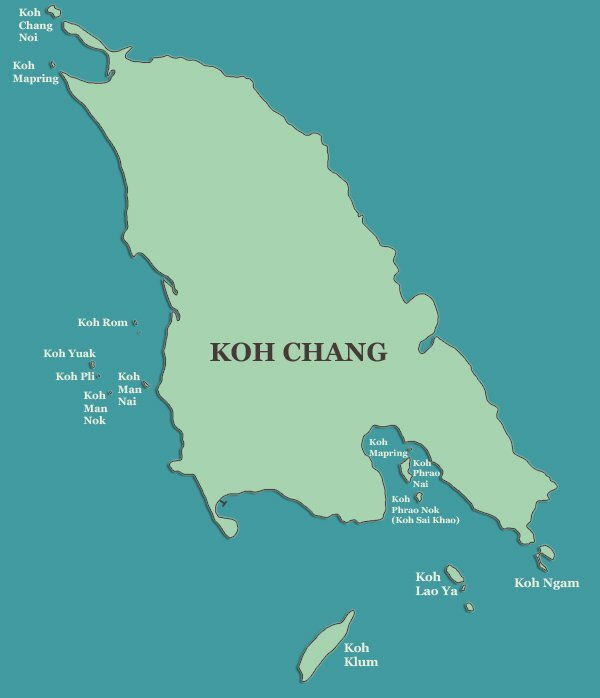 Up in the north, two Koh Chang Islands are located at the top of the bay at Klong Son, the larger Koh Chang Noi off the tip of the eastern peninsula and the tiny Koh Mapring off the western side. Both are, in essence, forested rocks, but Koh Chang Noi has a little beach looking across to the mainland and there is some decent snorkeling around Koh Mapring. You can kayak here from White Sand Beach or head down to Siam Royal View, the villas development on Chang Noi beach in Klong Son itself and paddle into the bay from the beach club. Sea Adventures, the catamaran, is the only boat trip that heads up to this area. Off the middle of the west coast, a whole cluster of Koh Chang Islands lie off Kai Bae Beach, with Koh Man Nai and Koh Yuak principal among them. Koh Man Nai is opposite the southern end of Kai Bae and at low tide, with those in June just perfect, it is possible to wade across, though underfoot is rather rough and jagged. 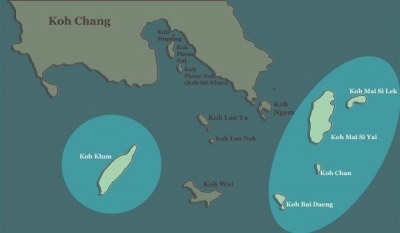 Kayaking is a much better option and then you can visit the other little isles behind, Koh Man Nok, Koh Pli and Koh Yuak. Koh Yuak has a small beach on its east coast, with excellent shallow water snorkeling just offshore. Sea Adventures, once more, stop here as part of their day along the coast and Nor Nou Kai Bae Huts Speedboat also do half days. Further north, sits Koh Rom, r(l)om, meaning umbrella or shade with the tree atop providing the name, whilst the rock of Koh Suwan is just next door. This too is an easy kayak from Kai Bae and with some nice snorkeling around and about, the effort is well rewarded. 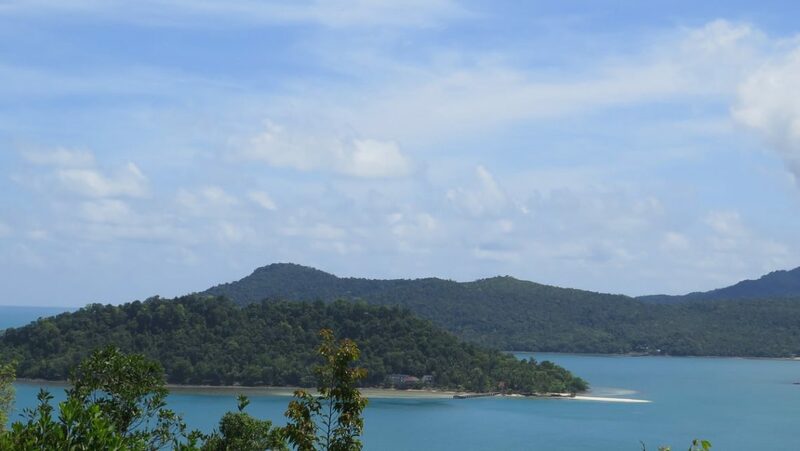 All of these islands form a majestic sight from the viewpoint at the start of the hill from Kai Bae to Lonely Beach, a photograph that captures perfectly the beauty of Koh Chang. Please click on the map to enlarge. In the south of the island, Salak Phet boasts three Koh Chang Islands, Koh Prao Nok, Koh Phrao Nai and Koh Mapring. Discounting the latter which is nothing more than a tiny rock, the other two are located in the middle of the bay and can be reached by kayaking across from one of the resorts in Chek Bae or from Baan Rong Than (Salak Phet Seafood). From this end of Salak Phet, small boats can be chartered to visit the islands or you can make a wider tour which might include Long Beach, Koh Ngam and Koh Laoya. Koh Phrao Nok is also known as Koh Sai Khao (White Sands Island) due to its sandbar and pretty beach at one end. It has its own resort, pier and restaurant but no occupants beyond a couple of local fishermen. The resort, at one time popular with Thai packages, was forced to close some years ago, perhaps due to local disputes about the piping of freshwater from one side of the bay to the island and now sits rapidly crumbling apart, battered by the elements. Parama Resort ferries their customers across to use the beach. The larger Koh Phrao Nai, meanwhile, which sits further into the bay, has a few stilt houses and the signs of a seawall at one end but nothing more, with no beach or other areas of interest. Koh Maisi Yai, a large and imposing island in the south just beyond Koh Ngam, also has an abandoned resort, this one last open for business around 1999. It now houses fishermen and their families in a small community, with stilt houses alongside, and has a much smaller sister island, Koh Maisi Lek, close by. Together with the forested rock of Koh Chan, which is to their south, you are unlikely to pay any of them a visit unless under your own steam, either by private boat or by kayak. The same remains true of Koh Bai Daeng which lies further south still, though there did used to be an overnight camping trip, sadly wound down due to lack of interest. The east side of Koh Bai Tang, as you may also see it named, like Koh Laoya, has a lovely stretch of beach and the Marine Park authorities have erected a small ranger station, together with a toilet block and washing facilities. A few kilometres out from Bang Bao on Koh Chang, Koh Klum is the first island seen as you leave the harbour proper and given its large size, it comes as something of a surprise to find it uninhabited. There is some good snorkeling on its north east tip, with a sand and shingle beach around the other side and the locals rate it as a sheltered spot for fishing, but beyond that, there remains little to be seen. Nonetheless, smaller launches and longboats on private charter do often pull in here as their first stop, before moving onto the real Koh Wai or heading across to Koh Laoya. Please click on the map to enlarge.